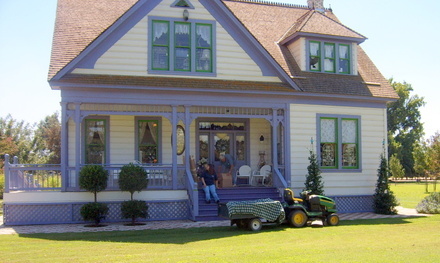 When the owners of Good Goods, Sandy and Jim Hall, bought the property in the 1990's there was nothing on the land, not even a well. Every building has been relocated and restored to its original beauty. The barn was disassembled piece by piece and moved from ten miles away. This was definitely a labor of love by people who appreciate history. 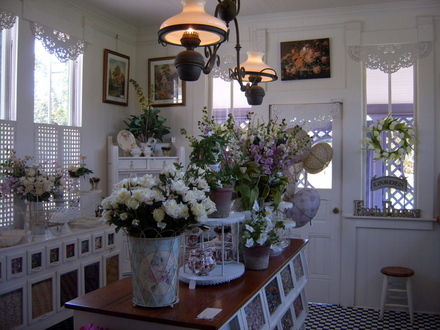 You can read more about this beautiful store in the November 2006 issue of Romantic Homes. I hope you've enjoyed coming along on my visit to my favorite place. Come out and see me sometime and we can go together. 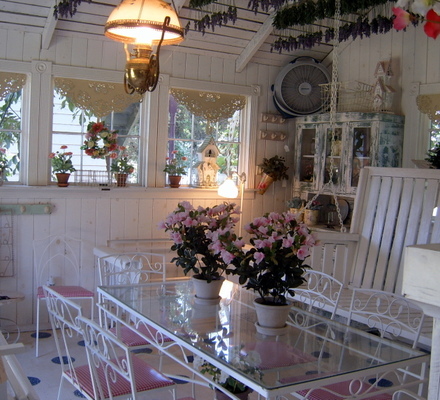 This little piece of heaven was featured in Romantic Homes Magazine last fall. 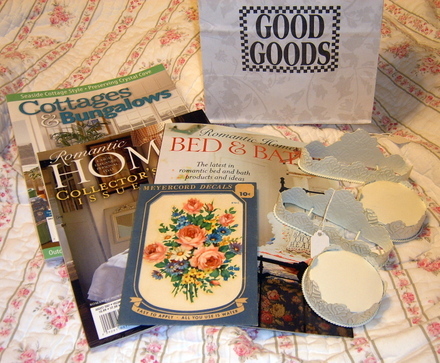 Good Goods was unknown to us then, but, has now become a favorite destination. 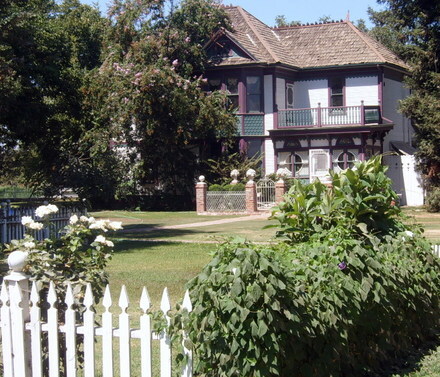 It is located 45 minutes south of Fresno in Visalia. 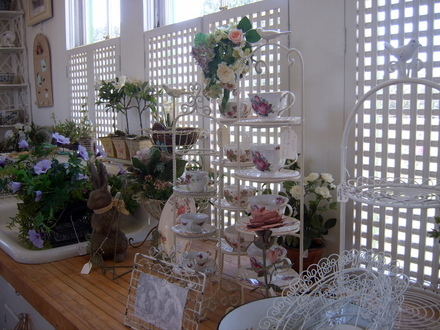 The store encompasses an old Victorian home, a 4000 square foot barn and a small cottage dubbed "the garden shed". 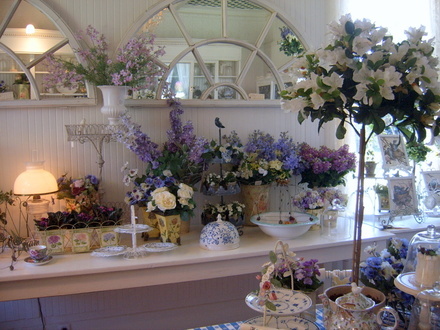 Every room in the house is full of white painted furniture and beautiful romantic treasures. We drove there today and as usual were not disappointed. 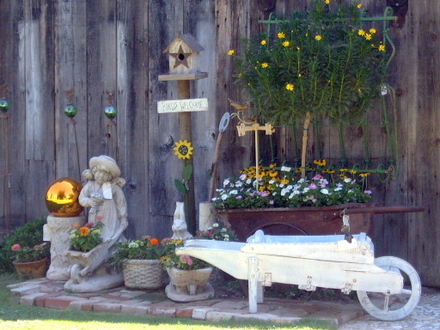 I'll take some pictures inside the barn later this fall when it is not 106° outside. 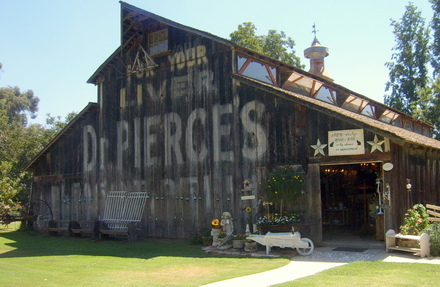 The barn is filled with restored cabinets and industrial furniture along with porcelains and metalware. In 1973, I was thirteen years old. I was the best tackle on the football team. I could throw a baseball hard and high and my brother would "catch it like Willie Mays". I was tan and strong and I ran with the boys. Along came Jimmy Anderson. I'll never forget him. He was older than us. He lived next door and he decided that "girls shouldn't be playing with boys". Jimmy's mother was Japanese and never ventured outside. I'm sure that had something to do with his autocratic decision. Now, maybe my brothers shouldn't have listened to Jimmy, but, the fact is that they did. 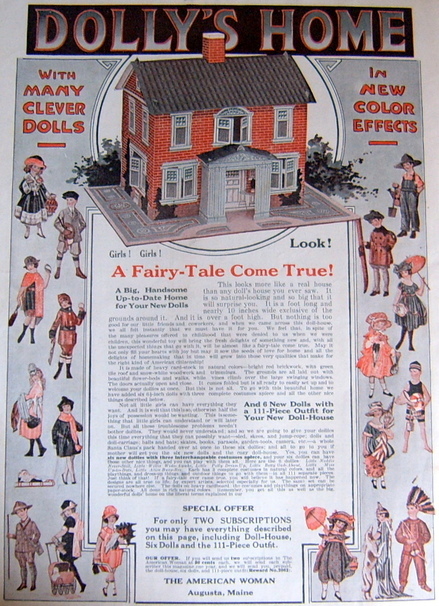 I have four brothers and that is the summer I went from being one of the boys to being a foo foo girl who stayed inside and played with dolls. I didn't play Barbies or house. 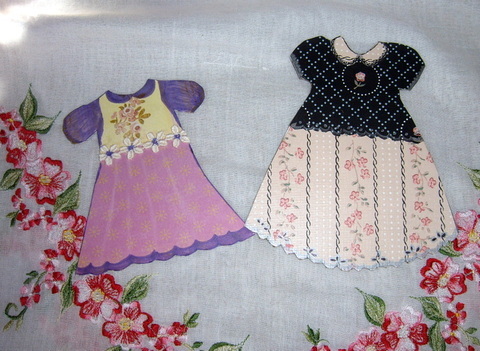 I was a fashion designer and paper doll artist. 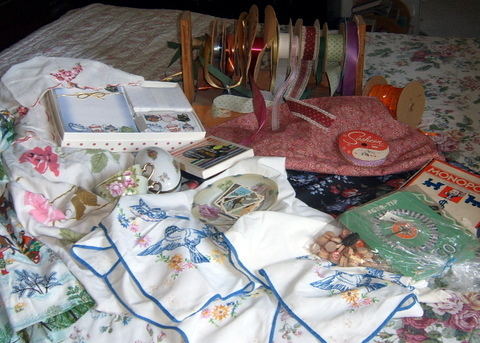 I cut and sewed and sat on my floor creating "things". I even wrote a newspaper for awhile. I don't remember what the disappointment felt like at the time to be demoted from the boy's team. 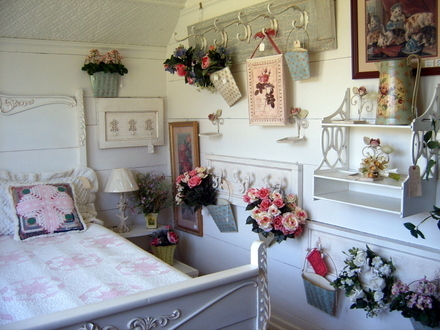 I do know I spent hours in my room pretending to be a girly girl. So Jimmy, I know you probably aren't out there reading my blog. Maybe your wife or a sister-in-law is and I want to tell you something: I'm not pretending anymore!! I've always believed in the premise that the good you do will come back to you tenfold. In Amy's case it must be true because I drew her name tonight for my ribbon giveaway. Amy just sent me an envelope of paper fun yesterday. I'll gather up some ribbon and send it out to you right away Amy. I can't wait to see what you create with it. 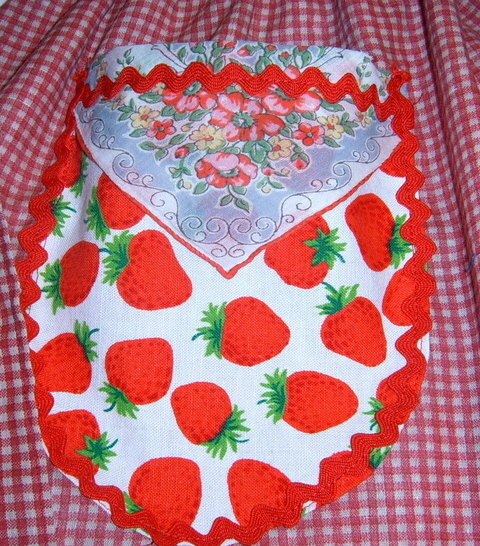 The picture above is a sneak peak at some aprons I am making for my Pay It Forward swap winners. 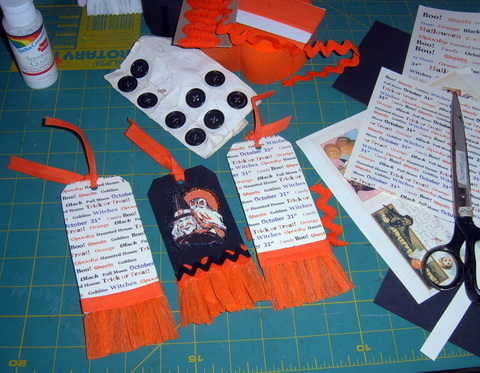 I'm hoping to get them done this week so I can start on the Black Cat and Pumpkin swap at HopHopJingleBoo. Talk about eye candy. 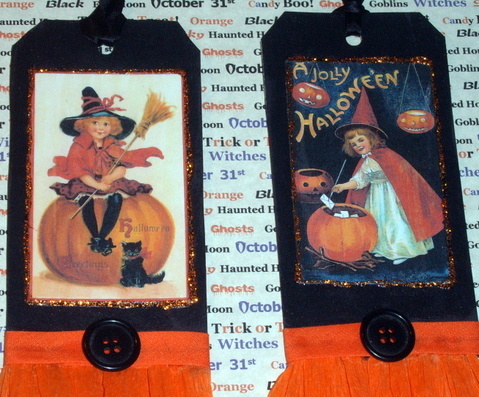 Go see all of Debra's awesome Halloween vignettes! I had every intention of sitting on my bed tonight and reading magazines and then watching a movie. 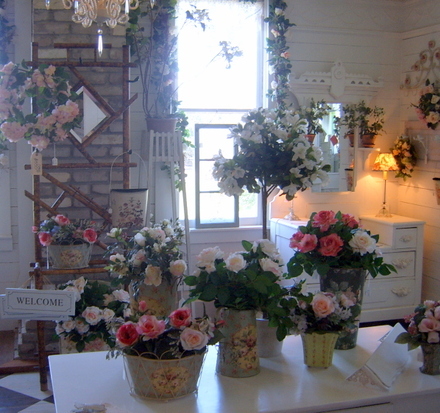 Instead, I am here because of an article in my new Romantic Homes Magazine. 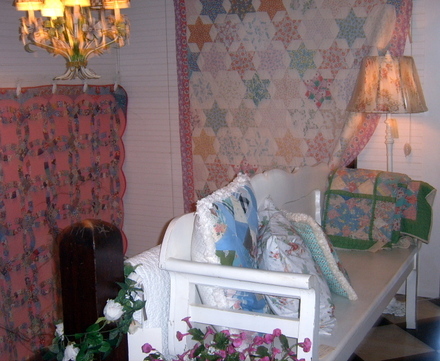 Kim from Daisy Cottage is featured in the scout it article. I was so thrilled for her that I had to hop on my computer and congratulate her and tell all of you about it. Kim is the sweetest blogger and always replies to my comments with a nice message. 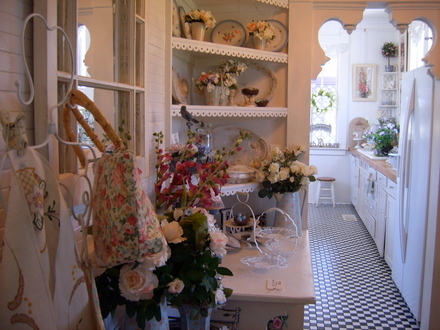 Not to mention, her house is so pretty. I could just move right in. Since I am already here, I'll show you what I found today. It was a great estate sale day. I found all of these treasures for about $20.00. I also found a tupperware container full of new yarn that I am giving to my daughter. Do you see the ribbon holder in the back? My hubby found it tucked out of the way on a shelf. I took it home, cleaned it and painted it. Foofed it up a little and now it sits proudly on my desk. Speaking of Foofing, I won a giveaway at Natalea's blog, Kandeland. 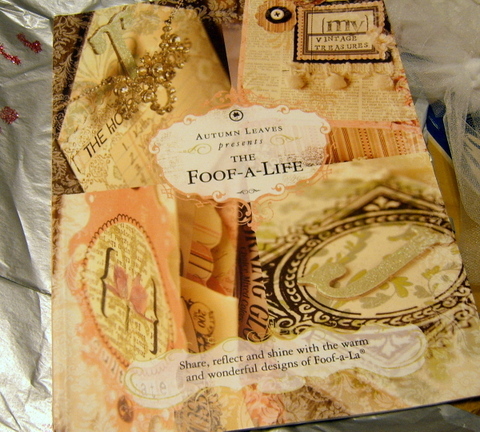 She sent me the book The Foof-A-Life. and lots of other fun stuff to play with. 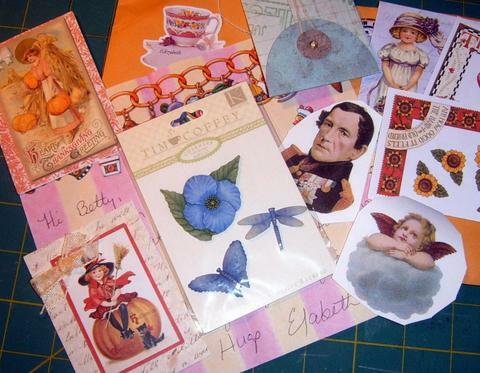 I also received an envelope of pretties from Amy at Abundant Curiosities. 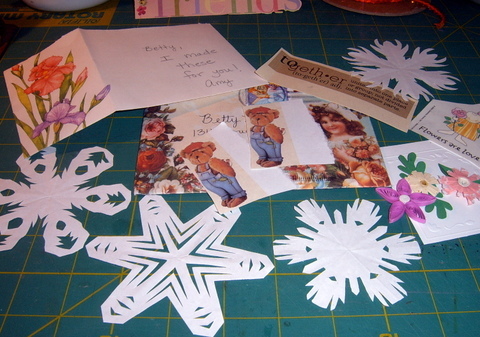 She is making these cute snowflakes and little flowers and selling them in her Etsy shop. I mentioned how cute they were and she mailed me some. 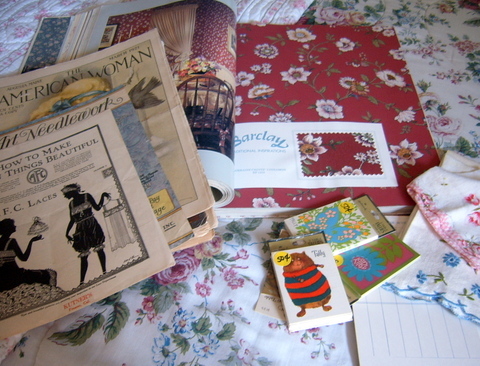 I'm going to have fun adding all of these bits and pieces to tags and collages. I toss and turn all night when I should be sleeping. I have a million ideas running through my head and can't seem to turn off my brain. I have tried meditating, medicating, praying and beating the heck out of my pillow. I have asked my husband to hit me over the head with an iron skillet but he claims that won't work. I sleep for an hour and I am awake and starting the battle again. I have suffered from insomnia half my life. If anyone knows a sure fire cure, I would love to hear it. 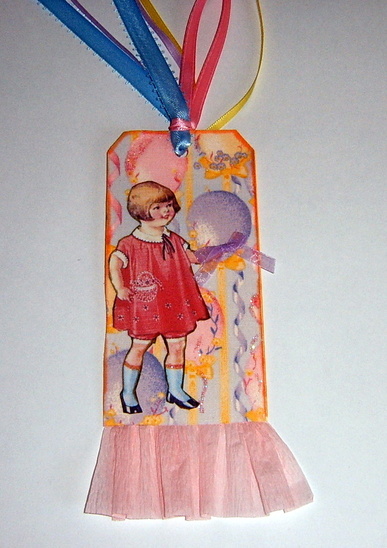 Last night, I was thinking of more ways to play with ribbon. You all have had some great ideas. I took Elizabeth's idea and made a ballgown with ribbon. 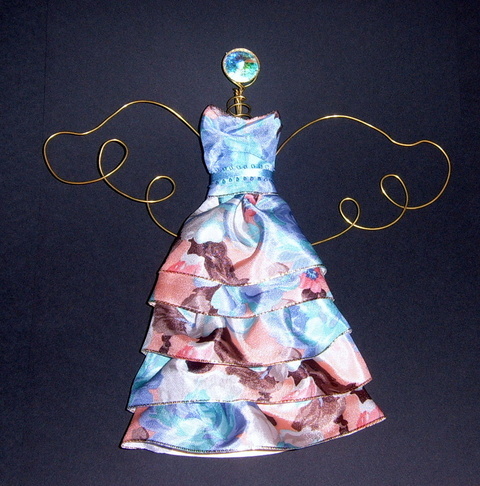 Decided it looked Audrey Hepburnish, glued it to a pair of angel wings and added a crystal from an old pair of earrings for the "face". A number of you said to make tags and I did make one. I did more gazing at the ribbon than actual creating. If Phyllis hadn't given me the award I would have definitely passed it on to her. She also gave it to Carole from Scoundrels and Rogues, who I would have also picked. Both of these ladies are so friendly and nice and I wish they lived next door. I'll have to think about this one awhile and then I will pass it on. Let me tell you about my day. 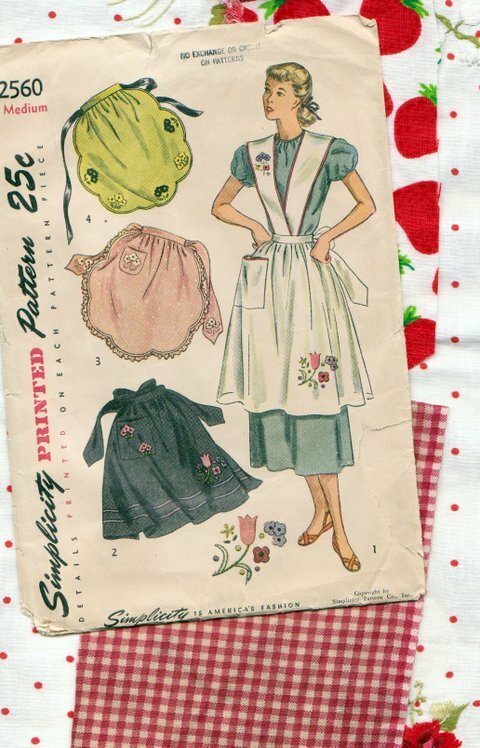 I woke up this morning planning on making that scrub top I have been procrastinating about since last week. 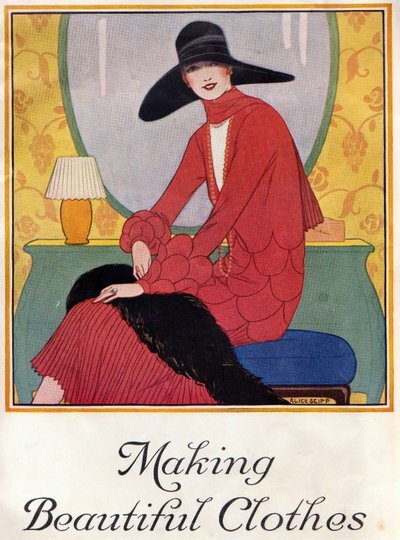 Well, I couldn't find the pattern. Anywhere. So, off I went to Wally World. On the way there, I stopped at the thrift store. I'll tell you about that later. At Wal-Mart, I bought what I thought was the same pattern I've always used. It was a size XL, the same size that I have always made my hubby's scrubs. I was laying out the pattern pieces and thinking to myself that the fabric must be narrower than usual. I cut out and sewed the scrub. I took it to my hubby so he could try it on before I hemmed it. 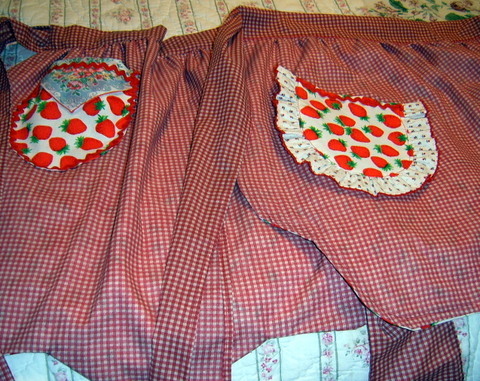 It was only then that I realized the scrub top was huge! I checked the pattern envelope back (which I should have done in the first place) and an XL was a size 52 chest! Sometimes I am such a dunce. So the scrub top went to the hospital with a note saying I goofed and hopefully the jolly green giant has just been added to the staff and needs a new scrub. 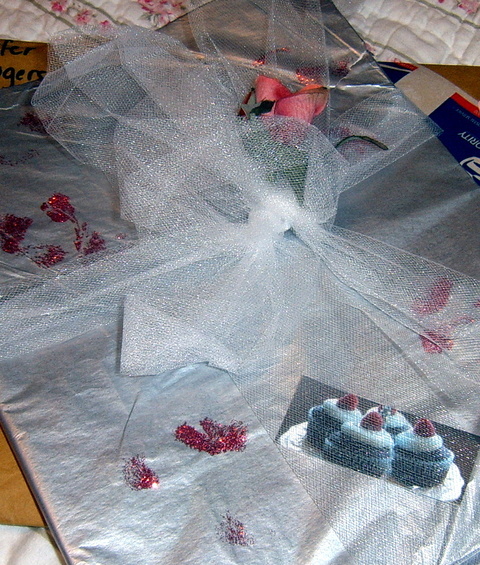 Now, I would be totally bummed about this, if I hadn't been to the thrift store and found this bag of ribbon. I didn't open it until I was done sewing and cleaning up. I am literally stunned at what I found. I thought it was just ribbon. You know, ordinary ribbon. 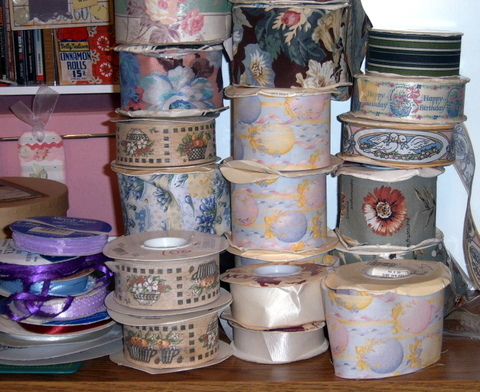 It turned out that there were over twenty rolls of fabric ribbon. 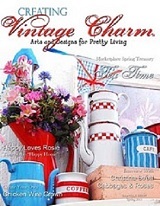 The ribbon with the light green stripe and roses is a 25 yard roll priced at 13.49. I paid 3.95 for the whole bag. 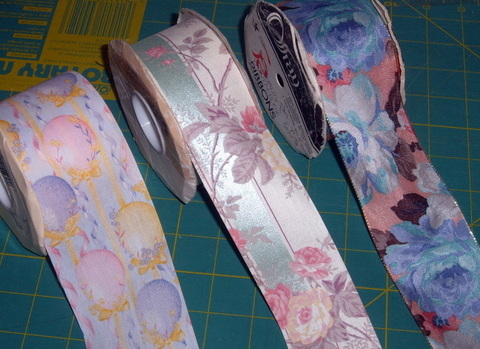 There are 4 rolls of the cute ribbon with the balloons priced at 9.99 each. Wow! Now tell me, my wonderfully, talented, crafty, friends, what would you do with this ribbon? I'm thinking collages, tags, altered art. I'd love to hear your ideas. 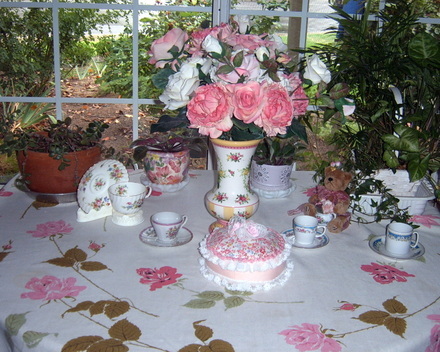 On Sunday, I'll draw a name from the comments and send that person some ribbon and lace, just because I want to. We are in the middle of another heat wave here in California. It is supposed to be 101° here today. I thought about going outside and doing a rain dance. Even though a rain dance would count as exercise, I decided to not chance fainting from heat stroke. 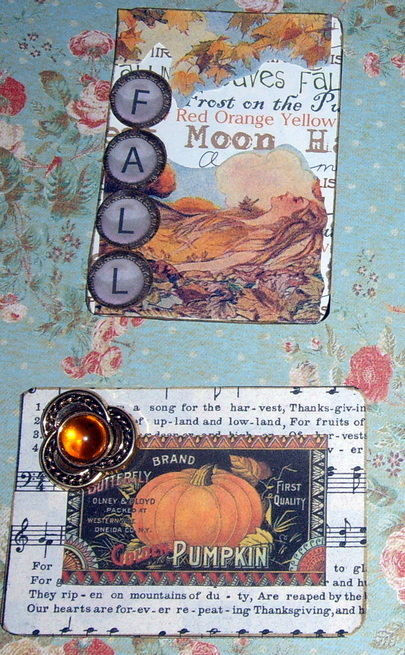 Instead, I am inside pretending that fall is here by playing with paper and working on Halloween tags. 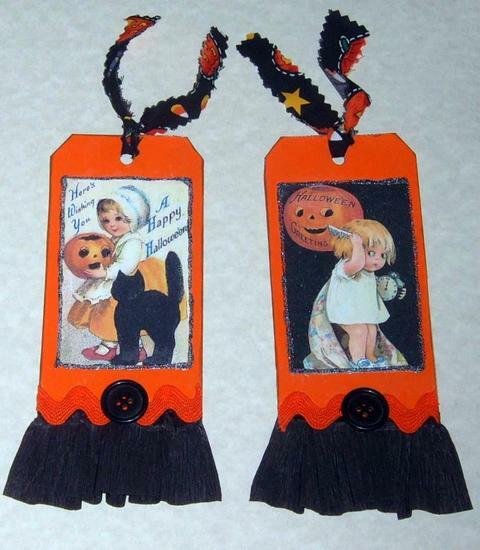 I had so much fun doing a Halloween tag swap with Debra at HopHopJingleBoo that I just kept making them. 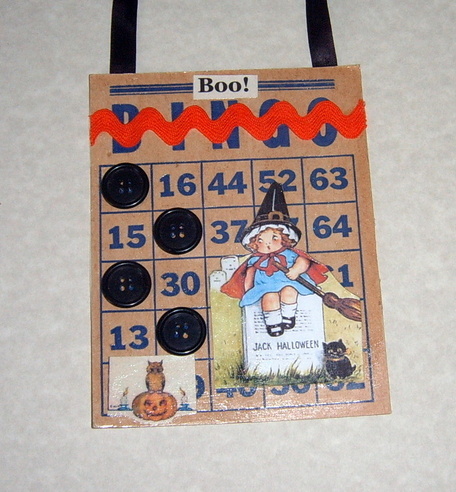 I also did a Halloween collage on a bingo card. I asked my hubby what he thought of it and he said that he just didn't get the "whole bingo card thing". I tried to explain that the bingo card is like a mini canvas. He didn't think I could see his eyes rolling around like a zombie. I guess I won't tell him about the bingo card gallery I have planned for the hallway. 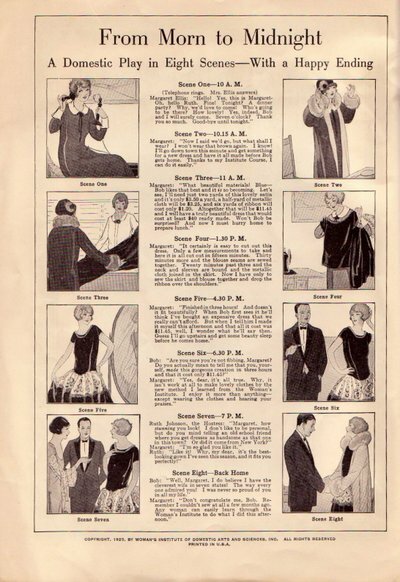 Yesterday, I went to my first ever "Divorce Prevention Sale". 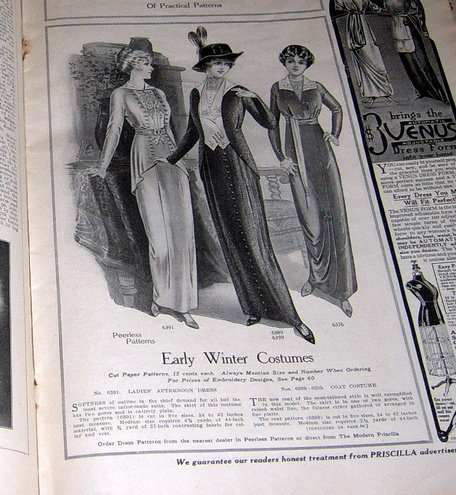 That is how it was advertised in the paper. I didn't ask any questions about the "divorce prevention'". 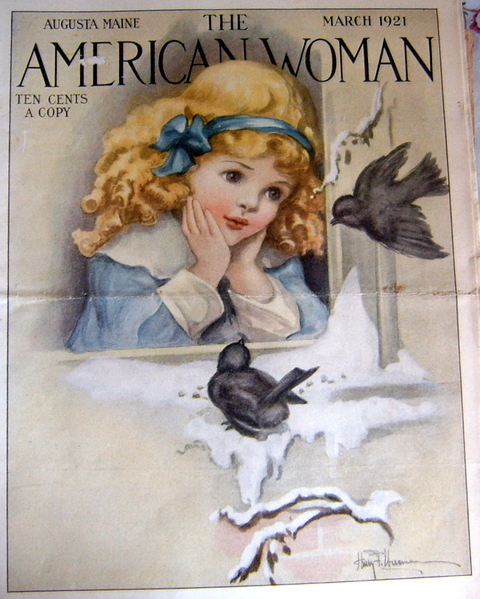 I was too overcome by visions of collages when I spied the wallpaper book and stacks of old Home and American Woman Magazines and ads. I only bought five magazines. I am kicking myself for not buying all of them. They were a dollar each! I went back later in the afternoon. 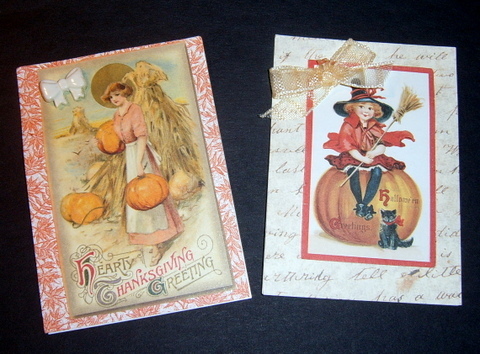 The lady who was selling them had gone home with them, but was planning on having another sale next week. I left my name with the people who held the sale. They were so sweet and invited me to look through the boxes that were going to Goodwill. I found a big bag of seam binding and ribbon for free! 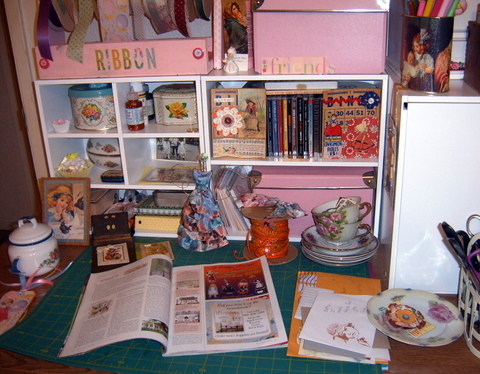 I am trying to get good pictures of the magazines. They are too large for the scanner and when I take pictures with my camera they don't crop well. Any suggestions? 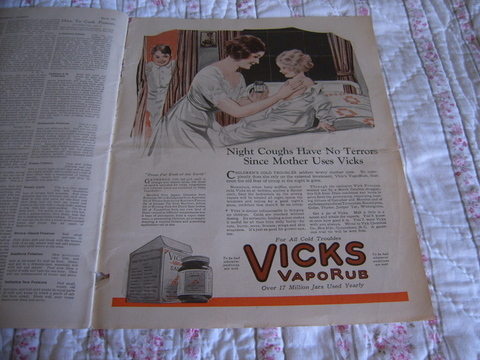 There are lots of fun ads and interesting articles. 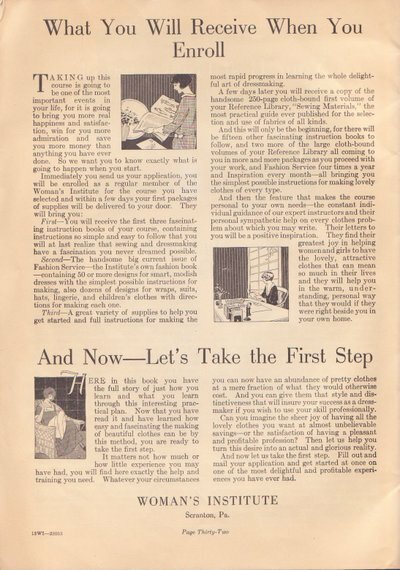 The magazines are from the early 1900's and advertise everything from pianos, shipped directly to your home for free, to weight loss cures. I wish I could still buy the soap that promises to shrink weight off while you bathe. 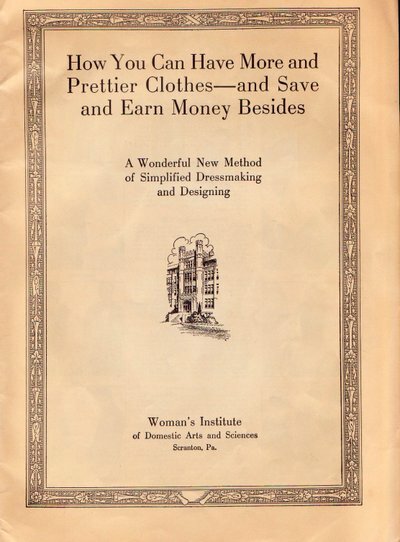 Found at an estate sale today, pamphlet from 1926, Making Beautiful Clothes, advertisement for a correspondence course. Click on the Morn to Midnight picture. 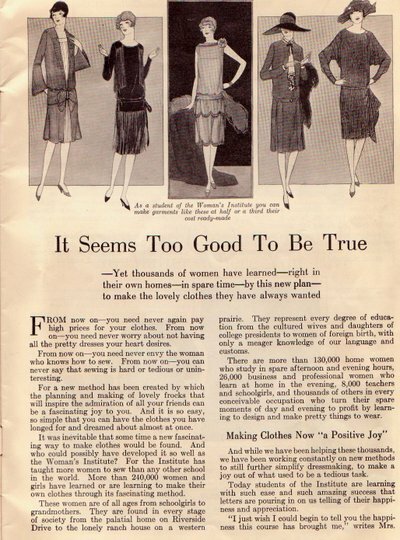 Have we really changed that much?